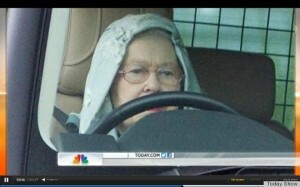 Queen Elizabeth II is cooler than any of us. She raises corgis, parachutes from planes with James Bond (sort of) and hangs out with some awesome girlfriends. Should we even keep trying? Her Majesty took to the wheel in Balmoral over the weekend — home of the infamous corgis vs. Princess Beatrice’s terrier smackdown — rollin’ in a Range Rover on her way back from a grouse shoot. But instead of her trademark floral hats — much more customary for a royal — she slipped into some unusual headgear, wearing what appeared to be a grey-colored hoodie. The 86-year-old queen usually scoots around in her chaffeured Bentley, so we’re surprised to see her gunning behind the wheel of a green Range Rover. But regardless… THAT HOODIE. Now, we have to ask. Was the queen actually decked out in a hoodie, or was her headwear just a scarf pinned down with bobby pins (which we can sort of make out in the photos)? Judge for yourself.